"A shadow on the wall," Varys murmured, "yet shadows can kill. And ofttimes a very small man can cast a very large shadow." Lord Varys was speaking with Tyrion Lannister when he suggested that a very small man could cast a very large shadow. Tyrion Lannister had just recently been appointed Hand of the King, and Varys was offering a lesson about power. Power, Varys said, was not a "mummer's trick," but a shadow on the wall—something visible to which men and women, lords and ladies, rich and poor could react—even when the source of the shadow was unknown. "Power resides where men believe it resides," said Varys, and while the trappings of power—titles, strength of arms, riches, and influence—were not power themselves, they were often enough to make others believe the holders were powerful. 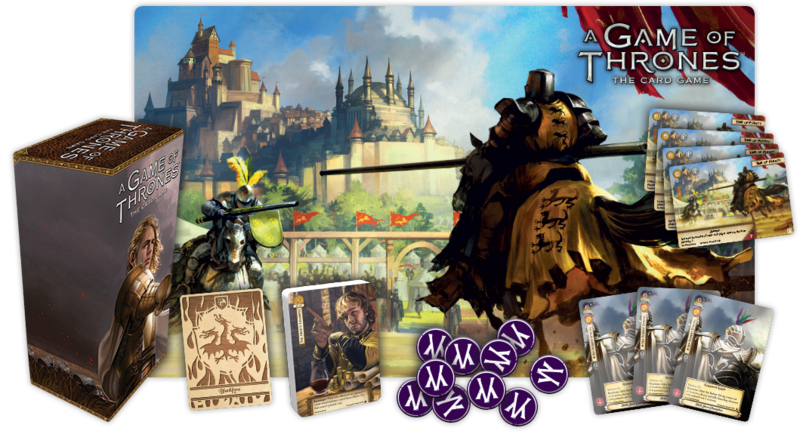 So it is with the prizes for which you'll compete at the 2018 A Game of Thrones: The Card Game Store Championships! Your prizes won't make you more powerful. They won't earn you more power in the game. But they may yet convince others that you're a player to be respected. Of course, there's only one way to win these prizes: to attend an A Game of Thrones: The Card Game Store Championship. You must play the game of thrones, and you must win. So take some time to review the prizes at stake. Then start plotting your path to victory. Prizes are shipping soon, events will begin later in December, and you can review our list of parcipating retailers to find an event near you! 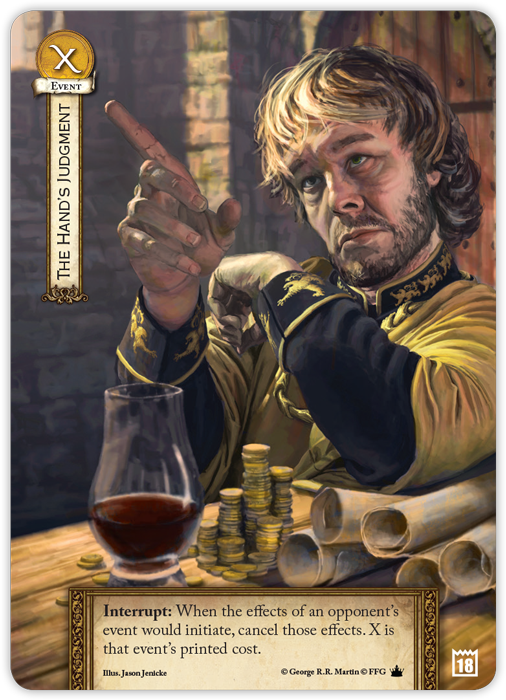 The Top 32 players at each 2018 A Game of Thrones: The Card Game Store Championship earn an alternate art copy of The Hand's Judgment featuring everyone's favorite Imp, richly illustrated by Jason Jenicke. 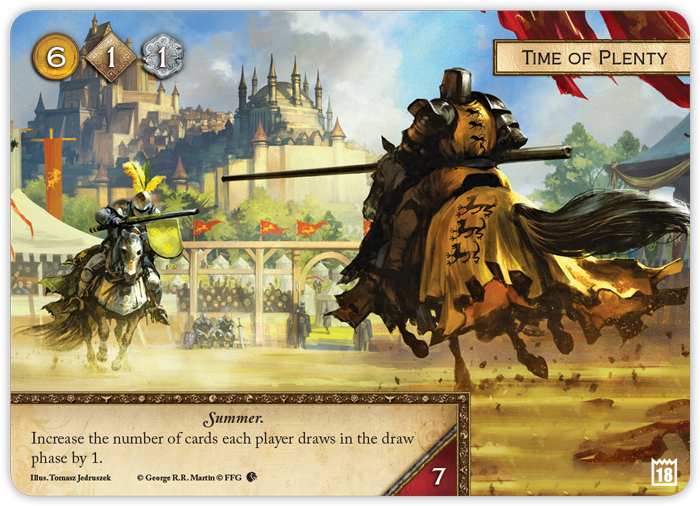 The Top 16 players each earn a copy of A Time of Plenty with alternate art by Tomasz Jedruszek. The Top 8 players each win a deck box adorned with a trio of notable—even infamous—White Cloaks. The Top 4 players will each claim a commemorative 2018 Store Championship playmat with the same lavish Tomasz Jedruszek artwork on the alternate art A Time of Plenty plot. If you make the Top 2, you'll win a set of acrylic shadow tokens that you can use to mark your cards in shadows, especially when you use the Assault from the Shadows agenda to put them into the shadows in the first place. 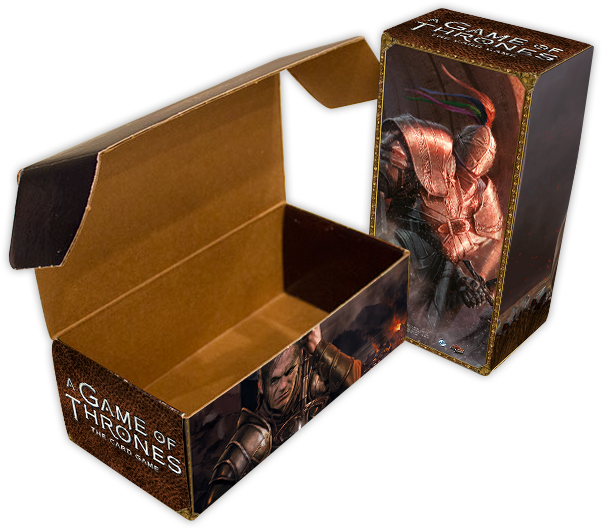 As a 2018 A Game of Thrones: The Card Game Store Champion, you'll have no need to rely on shadows and tricks of light to project your power. 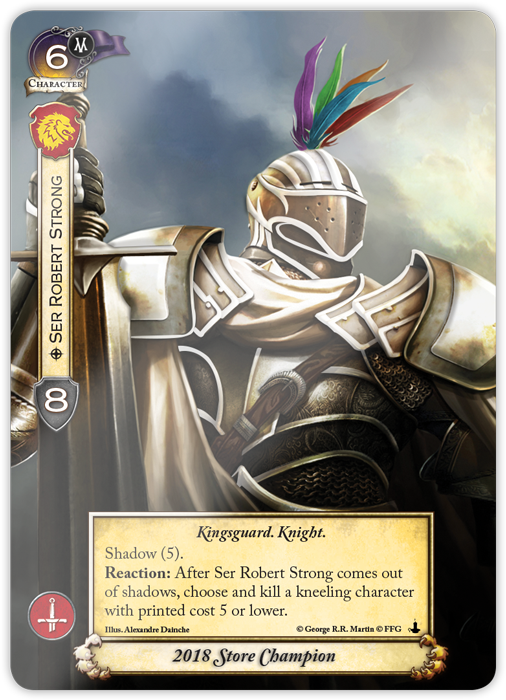 You'll exude power with every card you play, such as the three 2018 Store Championship copies of Ser Robert Strong that you'll earn with your victory. Additionally, you'll have amassed enough power to inspire others to follow you—and in a very noticeable fashion. 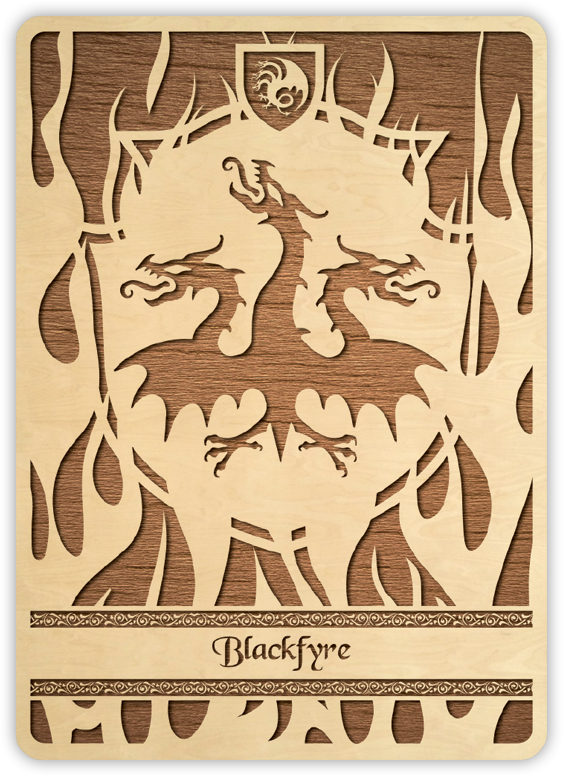 For your victory, you'll win a first-round bye at an upcoming A Game of Thrones: The Card Game Regional Championship, as well as wooden Targaryen faction card with which you can lead that House back to its full glory! Cast a shadow. Come out of the shadows. 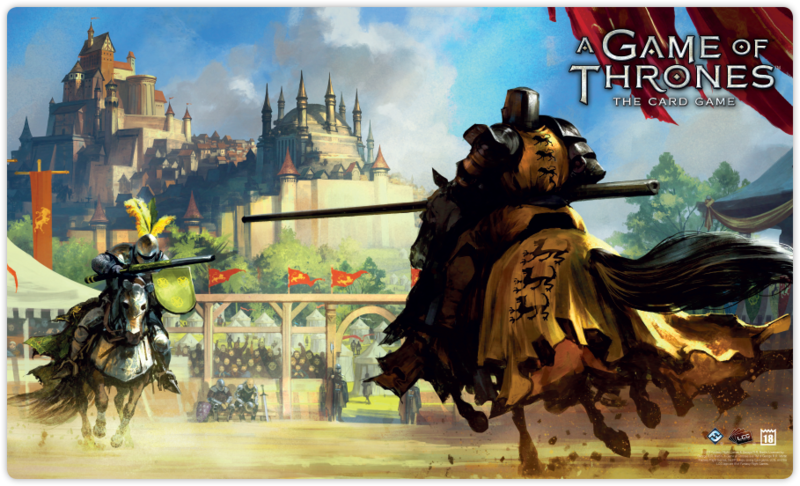 Take your next step toward King's Landing and the Iron Throne! A Game of Thrones: The Card Game Organized Play exists to help you meet new friends and play more of the game you love. You can also claim some fantastic prizes along the way, so start tinkering with your deck. Arrange your plots. Recruit just the right mix of armies, knights, lords, and ladies. 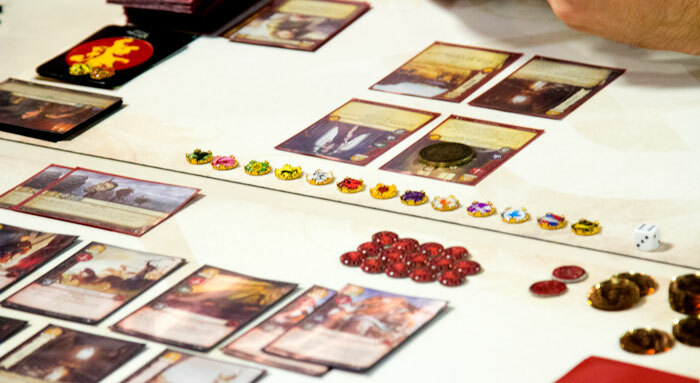 The 2018 A Game of Thrones: The Card Game Store Championships are a great chance to test your skill against the best in your area. The prizes will be shipping to retailers soon, and events will begin later in December. Talk to your local game store today to see when they'll be hosting their Store Championship!